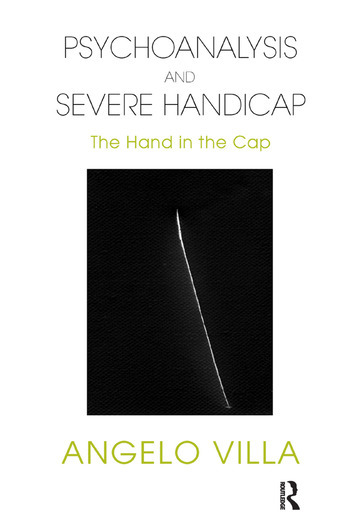 The book Psychoanalysis and Severe Handicap: The Hand in the Cap introduces an original look at handicap, a look aiming at capturing the subjectivity, no matter how weak or uncertain it may be, of the ill Other. In this light the work of operators can become an invaluable support to the creation of the self, a crucial help to self-narration, and a valid contribution to making one's way through the entangled intricacies of language. The text falls into six chapters, which elegantly and accurately lead us into the core of the problem tackled. Focusing on the difficulties implied by the recognition of the ill Other and the acceptance of the otherness, the author attacks those cultural policies which set autonomy and integration as absolute objectives to be achieved in the work on handicap. Instead, the author highlights the need of a path aiming at the structuring of the individuality of the disabled and at the molding of their subjectivity, starting from the subject's peculiarities.